In the 1970s, researchers fed a vitamin E deficient diet to a group of healthy volunteers (read: graduate students) for one year. There were no serious deficiency symptoms, as would be expected if you did the same thing with vitamin C or thiamin. The researchers concluded: “Vitamin E is a vitamin in search of a deficiency syndrome. Fast forward a few years and the Shute brothers were Canadian physicians who began using large doses of vitamin E to treat patients with heart disease. There were many noteworthy successes. Eventually, researchers figured out that the time to expression of a deficiency symptom may be years or even decades. Long term deficiency of vitamin D eventually may lead to cancer, depression, heart disease, auto immune conditions, and more. Long term deficiency of chromium may eventually lead to diabetes. Long term deficiency of vitamin E may eventually lead to heart disease, cancer, cognitive decline, and more. Vitamin E provides protection against the ravaging effects of oxidation, while also performing tasks as a bioregulator of DNA and cell membranes. Most western diets do not have enough vitamin E.
According to a Canadian physician’s report, “deficient diet” is one of the causes of cancer. Micronutrients are the “Magic wands” that aid our body to generate hormones, enzymes and essential substances for sufficient growth and development. As tiny as the quantities are, however, their deficiency can cause severe body disorders even cancer. “Vitamin E”, is a combination term which is used for a group of eight fat soluble antioxidants. Among the eight fat-soluble antioxidants that come in the umbrella of vitamin E, alpha tocopherol is mainly believed to be used by the human body. Vitamin E blocks the yield of reactive oxygen species and play vital role to immune cell functions. Vitamin E is also available in form of commercial supplements mainly derived from both natural and artificial resources. Only one chemical form of vitamin E, mostly alpha-tocopherol or even tocotrienols and a mixture of tocopherol are present in supplements derived from natural resources. Synthetic formulas contain all-rac-alpha-tocopherol. As vitamin E is a family of eight variants, each variant have its own different and unique properties. There are two subgroups coming in the category of vitamin E and each sub group contains 4 compounds. • Tocopherols – the synthetic alpha version officially approved by EU and most commonly available in throughout European’s high streets. • Tocotrienols-not in the European approved list. It was not thought to be actively stronger. With the increasing biological research, this subgroup seems to have vital health benefits. • Skin cancer: Vitamin E oil has wondrous benefits for skin. It can lower the risk for skin cancer. The powerful antioxidants of vitamin E act as protective barriers against the damaging effects of the sun. • Liver cancer: Report from the Vanderbilt-Ingram cancer center, analyzed the data from 133,000 contestants in shanghai Men’s and women’s health study who take vitamin E in supplements or daily food, or both. The scientists found that this super vitamin lowered the chances of liver cancer by 40 percent in members of the group with a high intake of vitamin E as compared to those with lower consumption. • Stomach cancer: According to an Italian report, low levels of vitamin E in human body can increase the chance of stomach cancer. • Lung cancer: A lung cancer related research in 1990 at Louisiana University Medical Center declared that lung cancer had notably lower level of vitamin in blood. This was later confirmed in another research study at Johns Hopkins School, USA. Again in 1991, a Finland’s report of non-smoking men revealed that people with lower levels of vitamin E in blood were 3 times more vulnerable to cancer. • Cervical cancer: Study in New York’s Albert Einstein College of Medicine showed that patients with most severe lesions were reported to have lower levels of vitamin E. This was further proved in Seattle where the highest levels of vitamin E in blood serum reduced the risk of cancer by two-thirds. • Prostate cancer: A Finished study showed vitamin E effects on smokers, among over 29,000 males, the group taking vitamin E had a 40% reduction in prostate cancer as compared to the placebo group. The group which was protected took 50 mg of alpha-tocopherol on daily basis five to eight years. A daily dose of 50 mg vitamin E supplement may decrease the risk of prostate cancer by 20%. 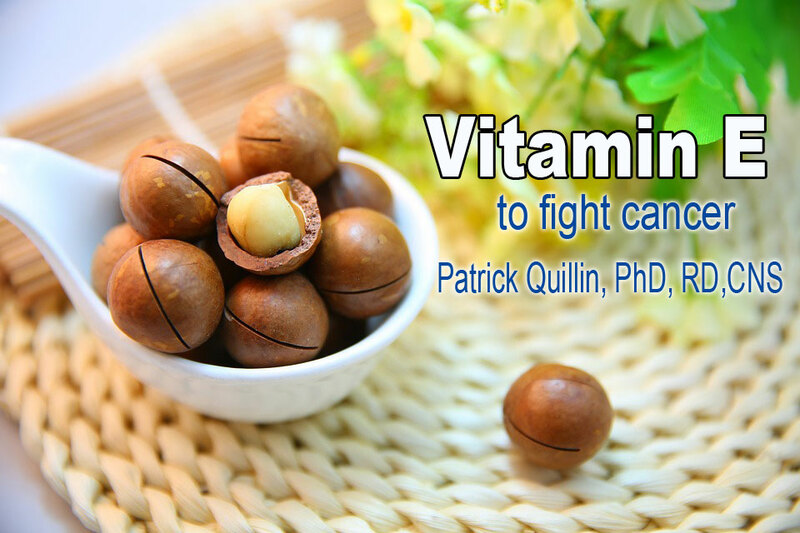 • For all cancers: Scientists at Tufts University, Boston concluded that a daily dose of 800 IUs of vitamin E for people over sixty years of age, significantly improve the functionality of immune system. Cancer treatments are mainly associated with chemotherapy and radiotherapy but if the main cause of the cancer is linked with any micronutrient deficiency then regaining of that micronutrient level will become necessary for the body. There over a thousand studies vitamin E variants. Most indicate that this natural miraculous vitamin and especially its tocotrienol form play vital role in the fight against cancer. Vitamin E (all 8 variants) work with selenium and other antioxidants in an important game of “hot potato” to subdue the effects of toxins and free radicals. In addition to its anticancer properties Vitamin E as an additive to conventional anticancer treatments, might reduce side effects. It was found that oral intake of alpha tocopherol can protect the cell membrane from radiation damage during radiotherapy for cancer treatment. Vitamin E supplementation is reported to reduce the side effects of radiation therapy in cases of head neck cancer. Are You Vitamin D Deficient? Vitamin E supplements lowered the risk of painful neuropathy that occurs with the use of platinum chemotherapy. In several reviews of the scientific literature vitamin E and other antioxidants did not reduce the effectiveness of chemo or radiation, but did enhance quality of life and outcome for patients being treated in traditional cancer hospitals.